~ Live Music & Salsa Lesson! ~ Raffle with Cuban prizes! Near beach & concession stand – Look for the Cuban Flags! CANAMERICA from across Central America singing popular songs from Latin America OKIMASKWESIS Cree/Nishnawbe female hip hop and spoken word artist singing and rapping to inspire social justice and change. >> Event is by donation! Suggested donation of $20 to just show up and enjoy or $10 if you bring a dish to share for the potluck! Join Vancouver Communities in Solidarity with Cuba as we come together to share great food, games and music in Trout Lake Park! July 2 will also feature a report back from the 25th Che Guevara Volunteer Work Brigade & Salsa dance lesson! The Cuba fundraiser & BBQ will kick off our fundraising campaign for the 7th International Che Guevara Conference taking place in Vancouver, Canada October 27-29, 2017. This International event will feature speakers from Canada, the United States and of course direct from Cuba! We hope you will join us on Sunday July 2, to begin our campaign towards a successful Vancouver 7th International Che Guevara Conference. 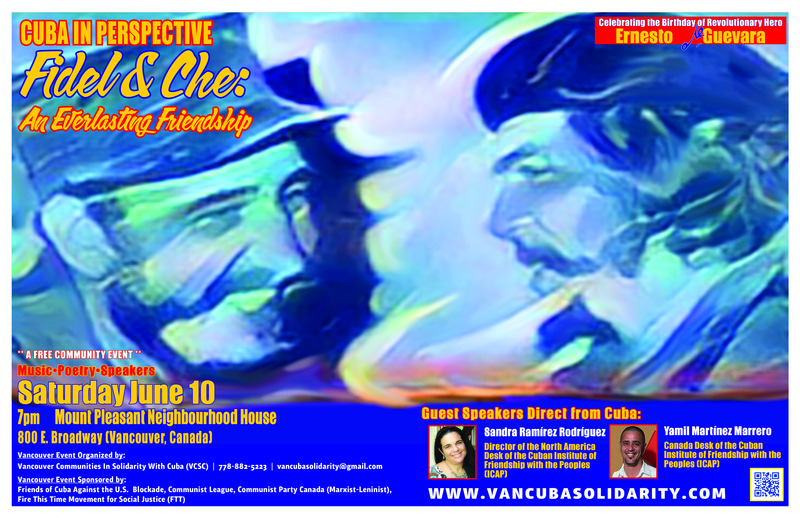 Join us as we welcome two guests from the Cuban Institute of Friendship with the Peoples (ICAP) to Vancouver. Since 1960, ICAP has been working together with the international community to promote friendship, solidarity and understanding of the Cuban people and the Cuban revolution. Sandra Ramírez Rodríguez and Yamil Martínez Marrero, of ICAP, will join us in Vancouver to share their perspectives on the everlasting friendship between Comandante Fidel Castro and Comandante Ernesto Che Guevara, as well as to discuss the perspectives for building Cuba solidarity around the globe, including the 7th International Che Guevara Conference in Vancouver in October, 2017. Along with these dynamic guest speakers and discussion, we will enjoy live music, poetry and refreshments.